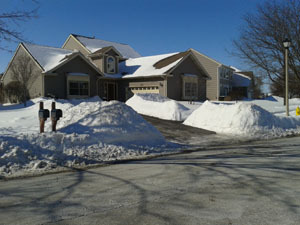 This was my house on Monday, Feb 10. The sun was shining, and the TV weathermen predicted we’d pass the freezing mark by Thursday! Hope springs eternal! 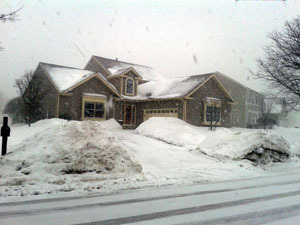 This is my house on Monday, Feb 17. We still haven’t gotten above freezing, and the TV weathermen tell us we can expect another eight inches of snow. What else should I expect? It’s the middle of February in the Midwest. It’s going to be cold. It’s going to snow. This is life… for now. But this isn’t life forever; we know spring will come because God tells us it will. How often do I frustrate God? Do I give Him more than enough reasons to think about giving up and moving away from me? Do I push Him to the limit of His perseverance? When I hoped for a thaw and it only got colder was my frustration as great as God’s when he hoped I would finally learn an important lesson, only to see me fail again …and again? When I looked for sunshine and saw clouds, was I as disappointed as God was when He looked for me to give Him glory, but instead saw me take credit for a work that He did? Fortunately God promises me that He will never give up on me. And, He will never give up on you! God knows that we are mere humans, fallen and sinful. God doesn’t wait for us to blossom into beautiful people before He lavishes His love on us. He loves us just as we are, cold, gray, dark and dreary, because He knows the warm, colorful, joyous and beautiful personalities He is developing within us. Amber, I love those verses! Nothing is wasted in God’s plan!! Thank you! Great perspective on this snowy morning in NJ. Spring will come!! Again, thanks Marcia for your encouraging, God inspired words! God is so good! It isn’t hard to be a christian, but we sure make it hard. hahahahaha, yes, Bev, we surely do! How appropriate your thoughts are, Marcia! I’m sure He sees me as dark and dreary at times also..and it brought tears to my eyes. Thank you for the reminder that it doesn’t stay that way!! There is such hope in this message!! This brightened my depressed mood!!! So thankful that God does not give up on me when I am feeling gloom and doom because with Him there is joy and peace!!! 🙂 Yes Janet, he’s working on me too! Every day is a fresh start at walking the talk.